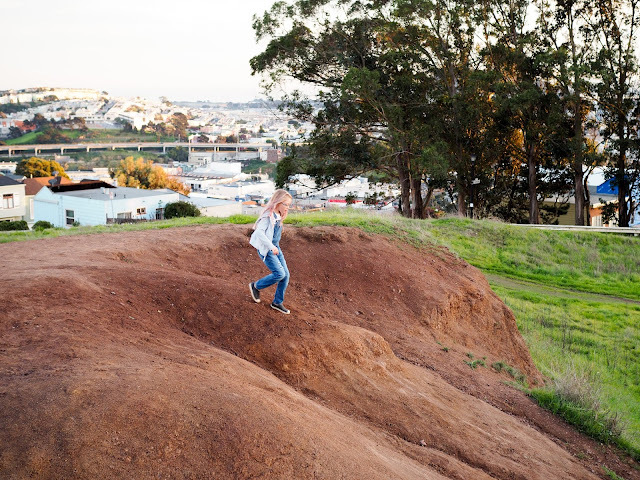 San Francisco is a city of hills. 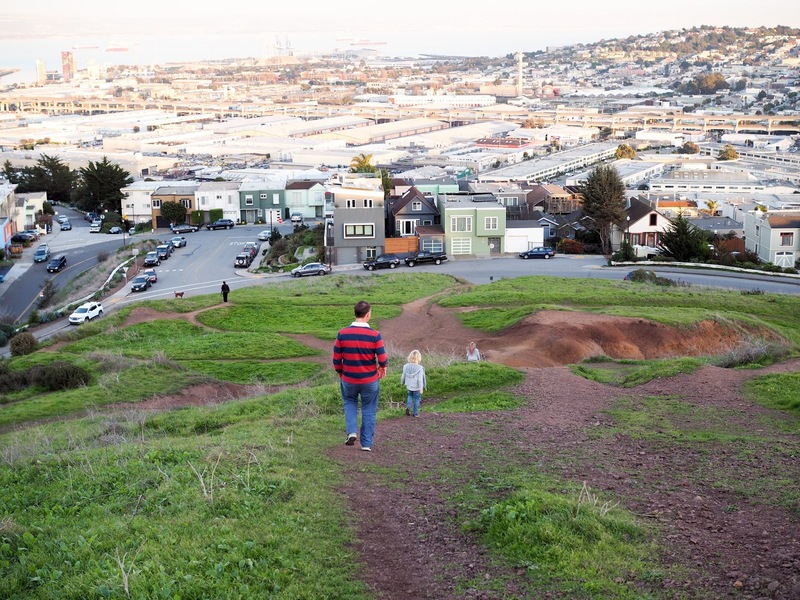 Some of these hills are densely built up, while others have been reserved as green space within the city. 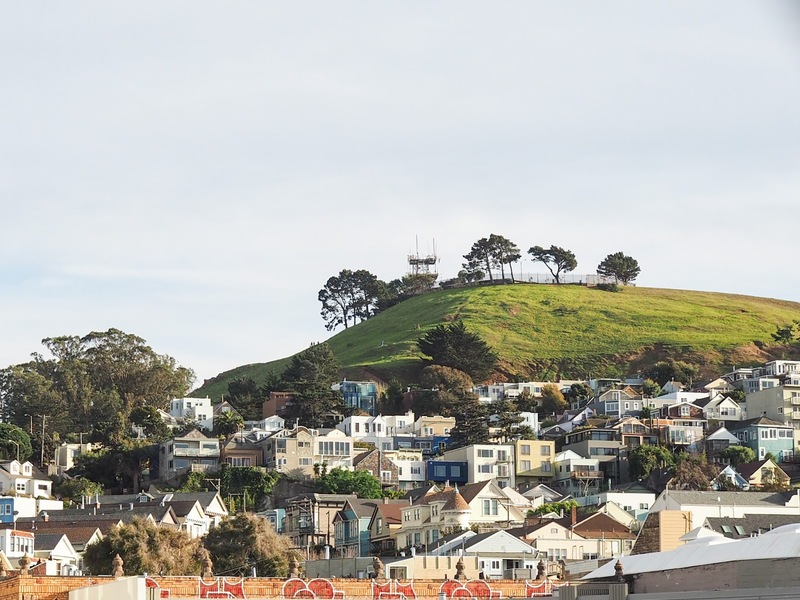 One such hill that remains undeveloped is Bernal Heights. 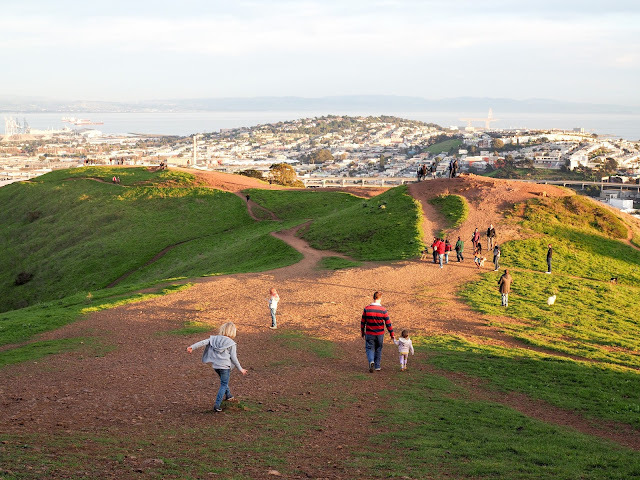 While the lower slopes of the hill are built up with homes, the top of the hill is a spacious park with hiking trails and stunning views. A little while back we spent an afternoon hiking Bernal Heights. 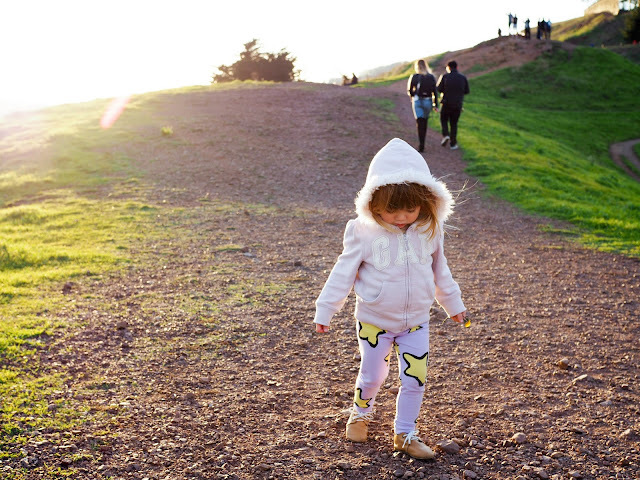 The walk up to the top of the hill is pretty easy, and even Mathilde managed to walk the whole way up and back down. 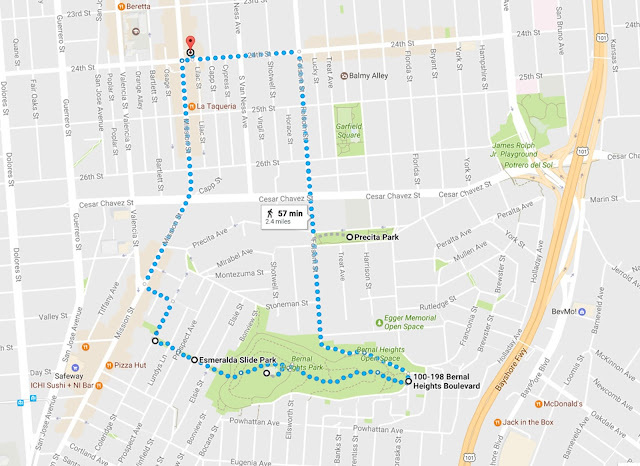 We took BART to San Francisco from Berkeley, then walked from 24th Street Mission station. Our walk took us through residential streets, up staircases and, at one point, through a small park with slides built into the hill. Esmerelda Slide Park (located at the top of the Esmerelda Avenue stairs at Winfield Street), was the perfect pit stop for the kids. 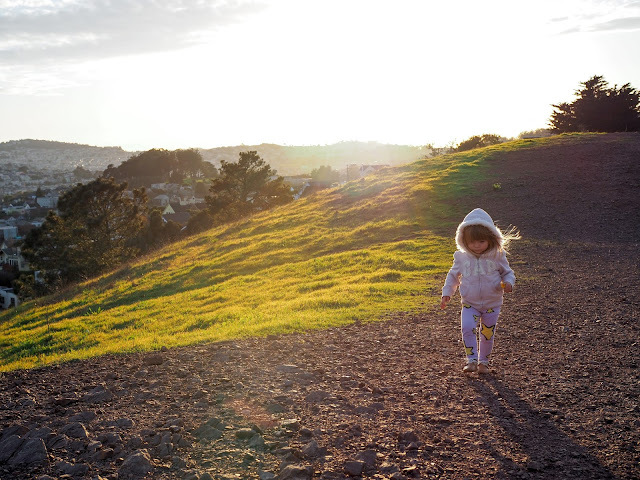 While the walk was not very far (maybe 20 minutes at the most) it was mainly uphill and little legs were ready for a rest, or, as it were, a chance to stop and play. 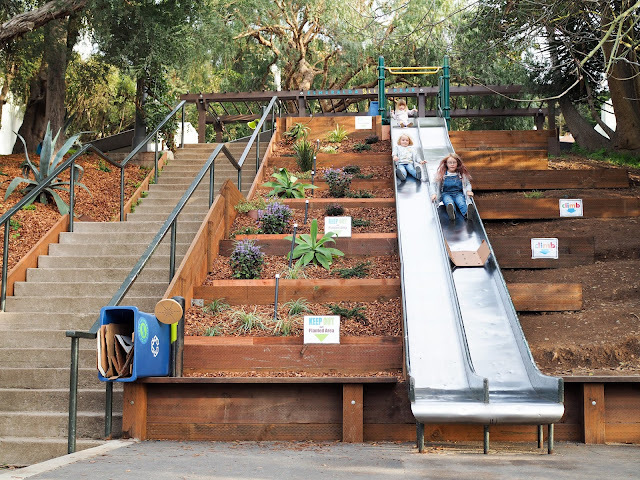 We stopped at the slides for maybe 15 minutes, but I'm sure the girls would have been happy to stay all afternoon! 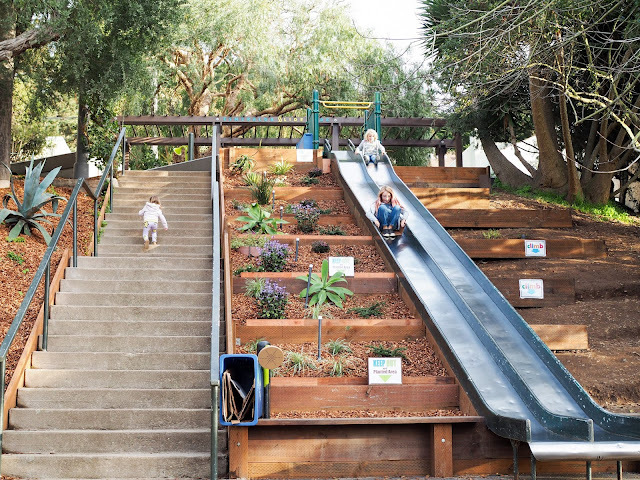 Don't you just love finding unexpected things like this? 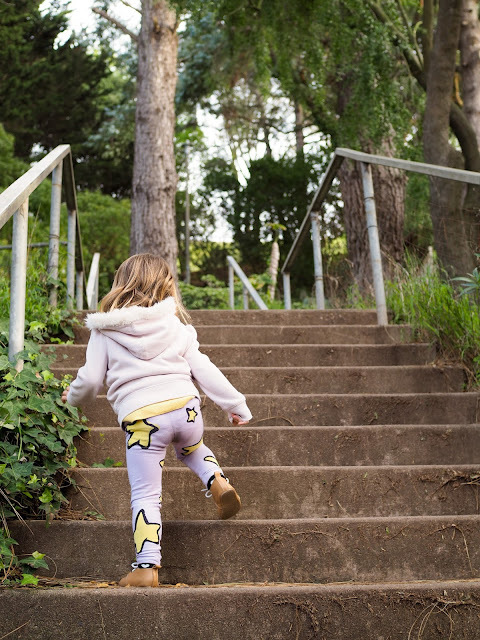 From Esmerelda Slide Park we continued a little further up the hill and the entrance to the park was right there in front of us - up one more staircase, of course! From the entrance of the park we made our way up a dirt path and a few steps.We turned a bend and suddenly the entire city was laid out in front of us. 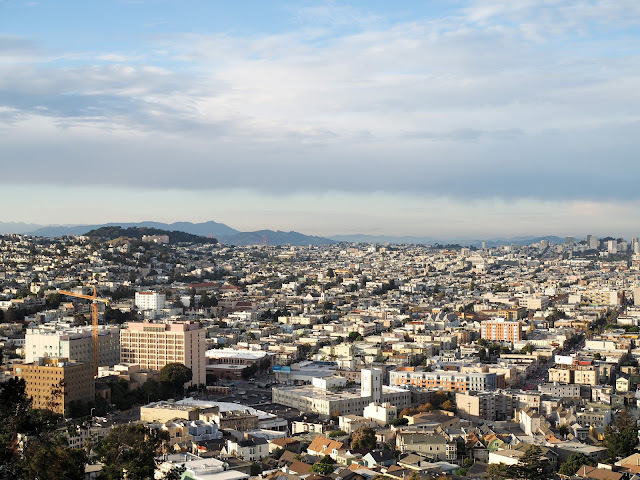 And when I say the whole city, I mean it! 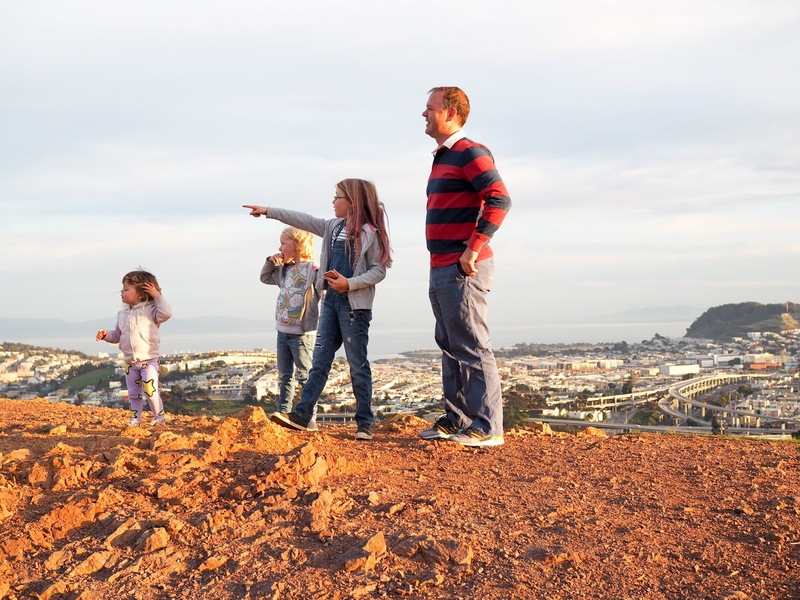 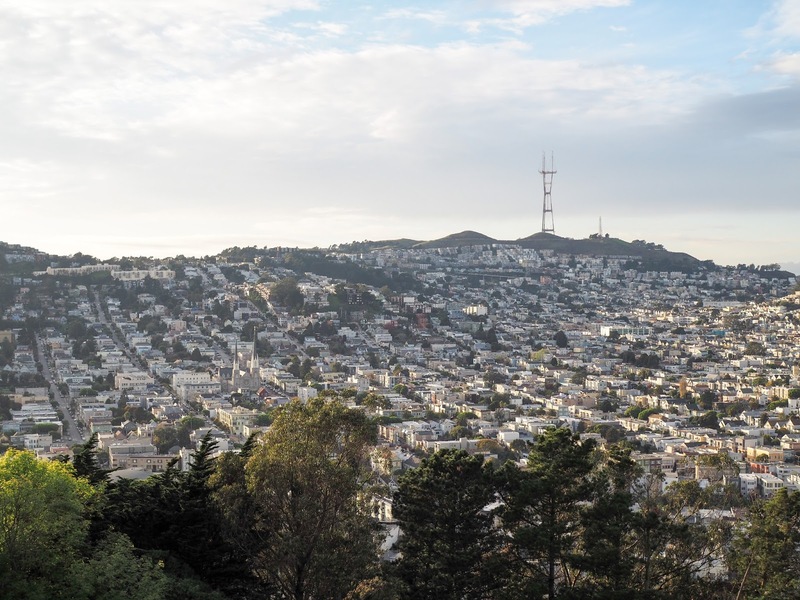 From the top of Bernal Heights Park visitors can take in 360 degree views over San Francisco and the Bay. The views are absolutely stunning. We were lucky to visit on a pretty clear day so we were able to see all the famous landmarks including the Golden Gate Bridge, Sutro Tower, the Bay Bridge and Treasure Island, and even across the bay to Oakland and Berkeley. 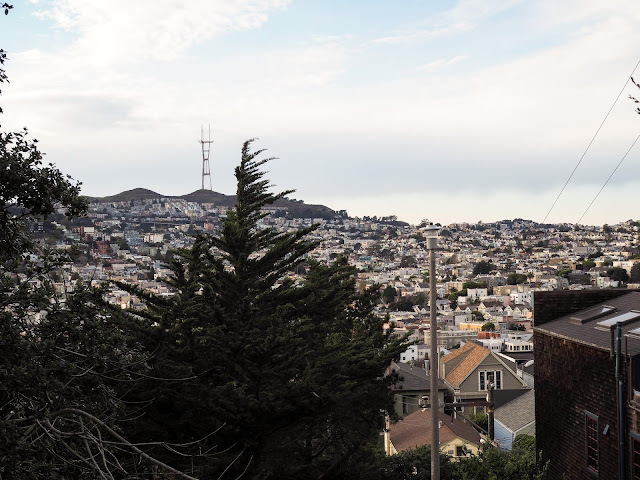 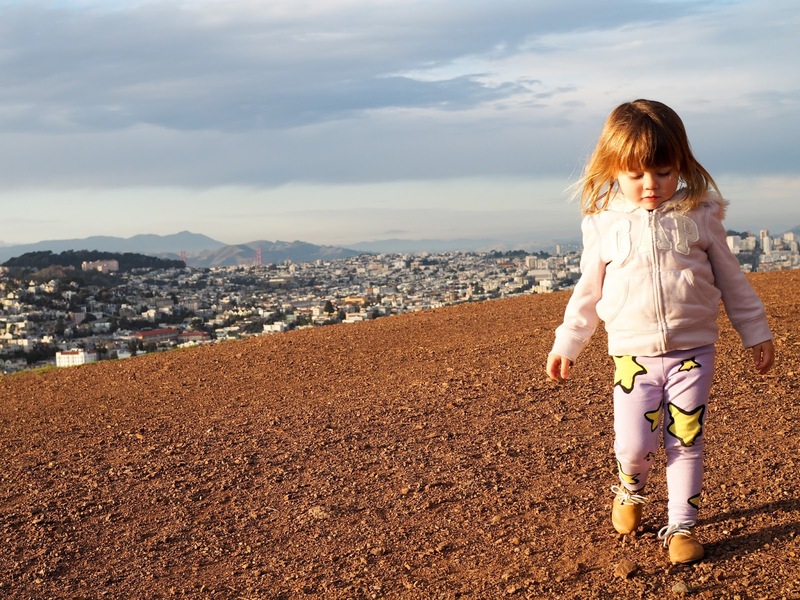 We'll definitely be taking all visitors to Bernal Heights for the views from now on! Just over the top of the hill we came across a tree with a rope swing hanging from it. 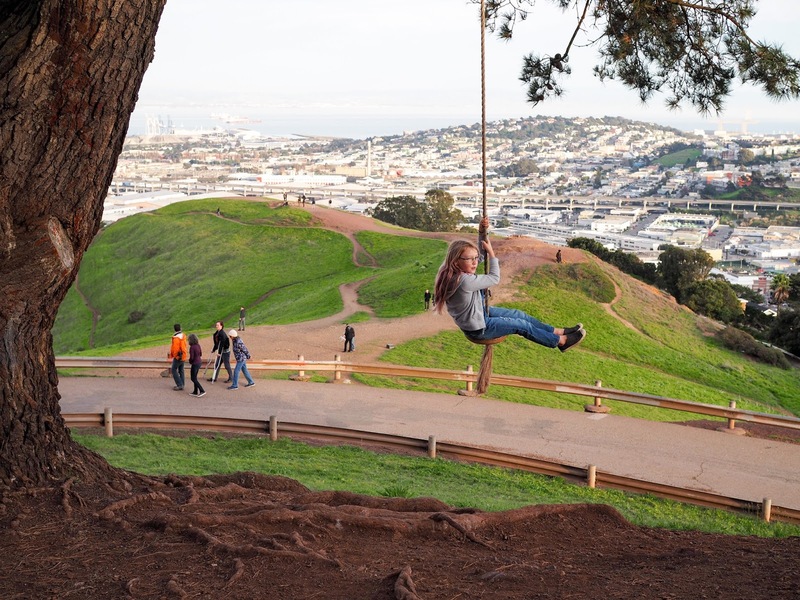 The girls were a little scared at first, but after watching other people swing on it Ava decided to give it a try. She loved it! 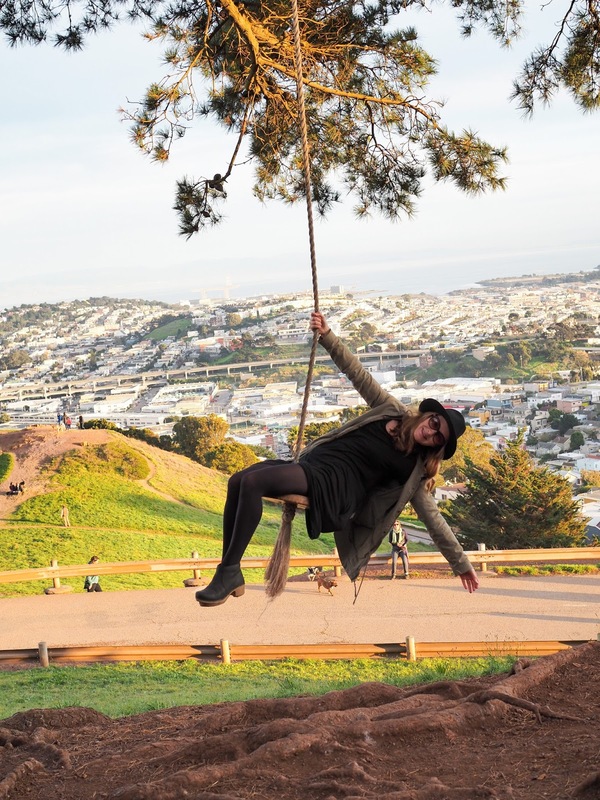 The swing isn't actually all that high off the ground under the tree, but as you swing out it feels like you're swinging above the city. I had a go too, but Lola gave it a miss. 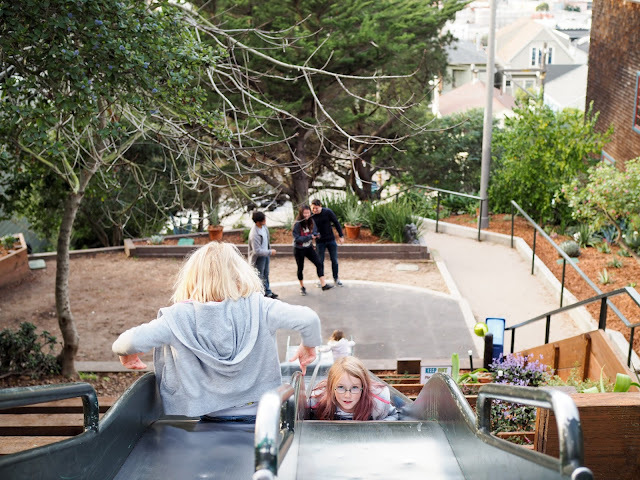 Mathilde was desperate to go on it but she was just a little small this time. The sun was setting behind us as Ava swung making for an amazing silhouette. After playing on the top of the hill (and catching Pokemons on the top of the hill!) 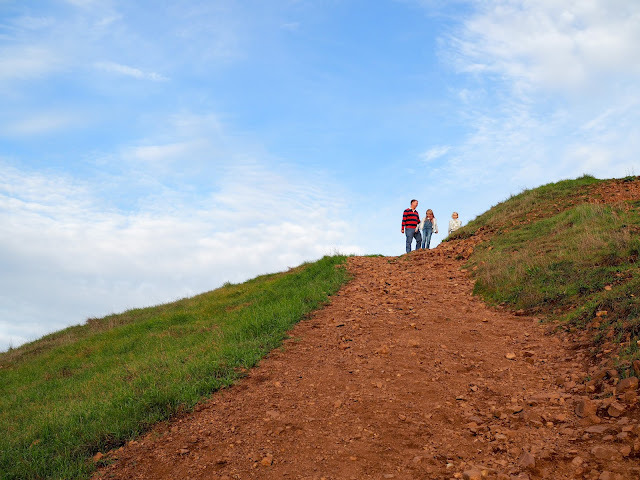 we started to make our way down the opposite side. 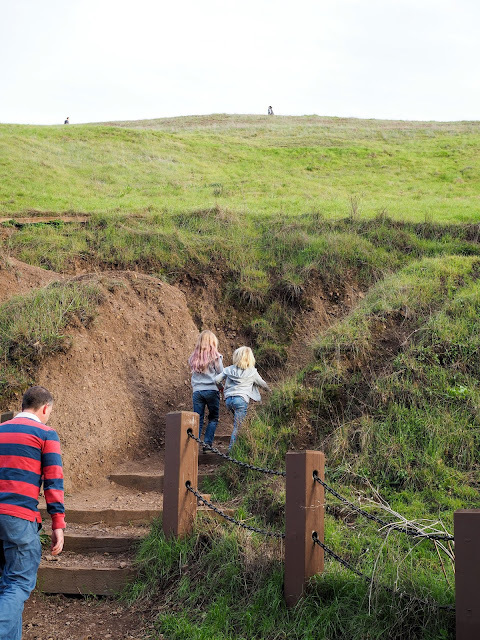 Here we found lots of little paths leading over grassy mounds - perfect for running around on - and quite a few people walking dogs, which Mathilde was excited about. 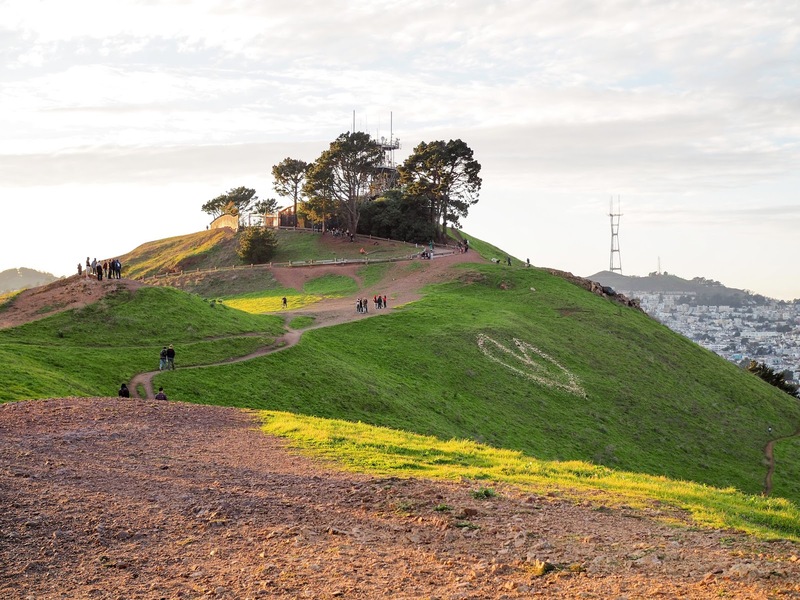 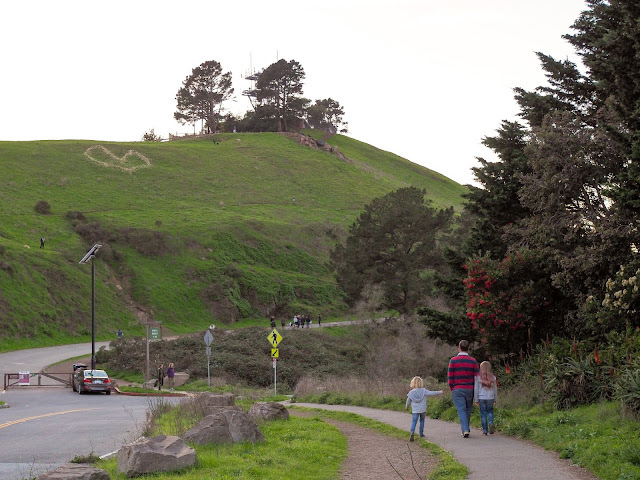 Looking back toward the peak of Bernal Heights we noticed a heart carved into the hillside. 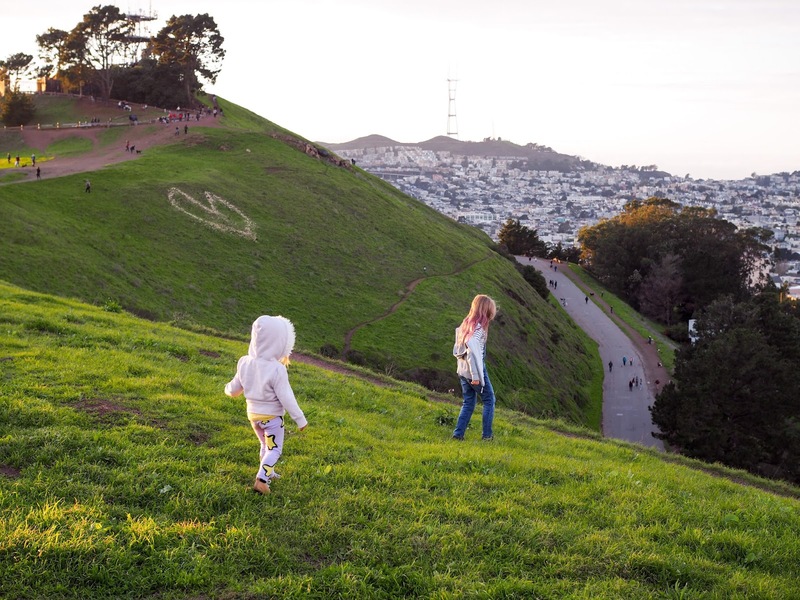 The kids thought this was pretty amazing, especially Lola who is obsessed with love hearts. 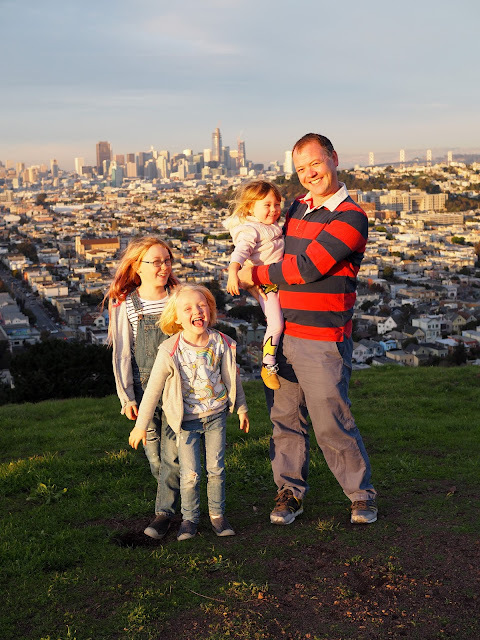 We stopped to try and take a few family photos with the sprawling city behind us. 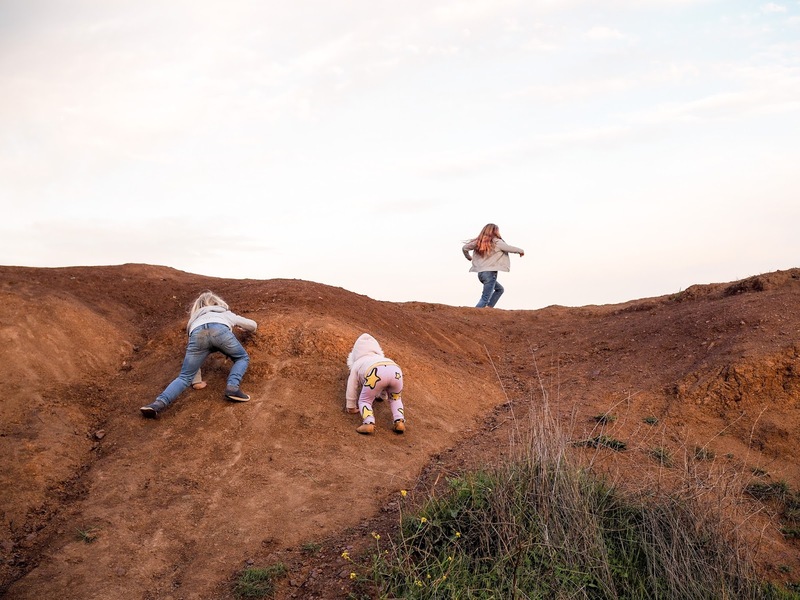 I say "try" because the kids were much more interested in running around than posing for photos! You'd think I be used to that by now, wouldn't you? 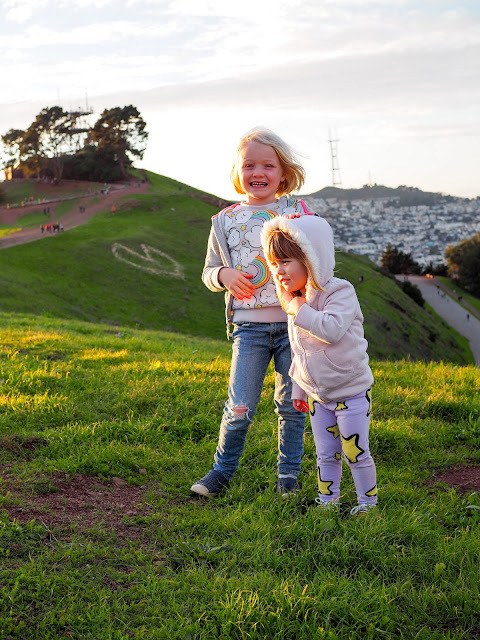 The girls would've loved to have stayed on the hill playing and running around, but as the sun was getting low, and our bellies were starting to grumble, we continued down the hill to go out for an early dinner. Near the bottom of the hill the girls were excited to find grass-less mounds that were perfect for running down and climbing back up. They were perfect for covering their butts in red dirt too! Ha! 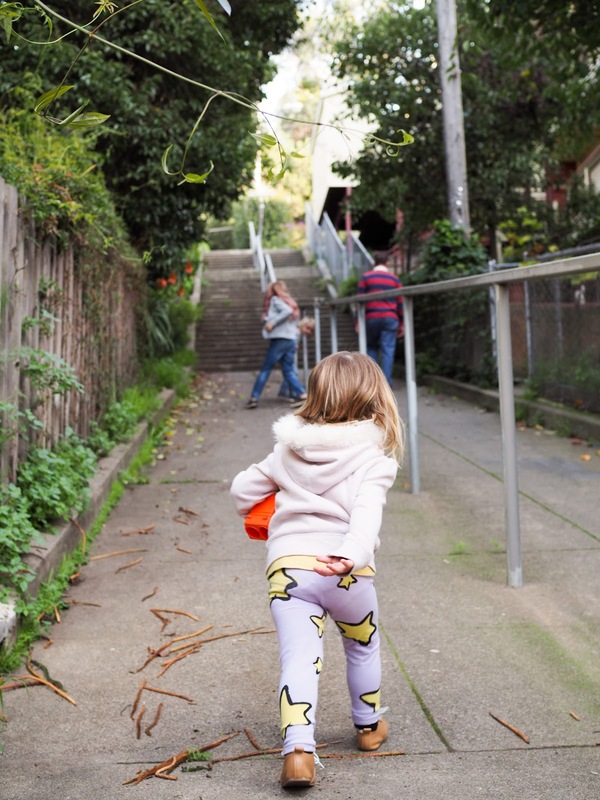 As we approached the street Mathilde pointed out a picture of a "doggy" on a sign. 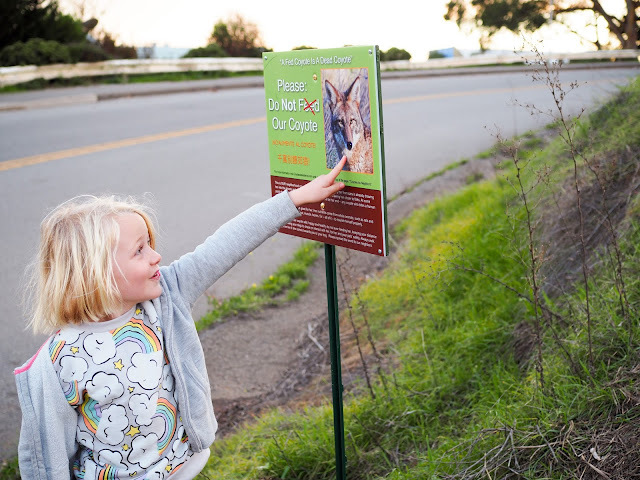 Lola went to check it out up close, but it wasn't a "doggy" on the sign, it was a coyote! Luckily we didn't see any coyotes ourselves, but it's good to know that they are there and to keep an eye out, especially if hiking in the early hours or after the sun goes down. From the bottom of the hill we walked along Folsom Street where we noticed a small parking area - handy if you drive to Bernal Heights Park. 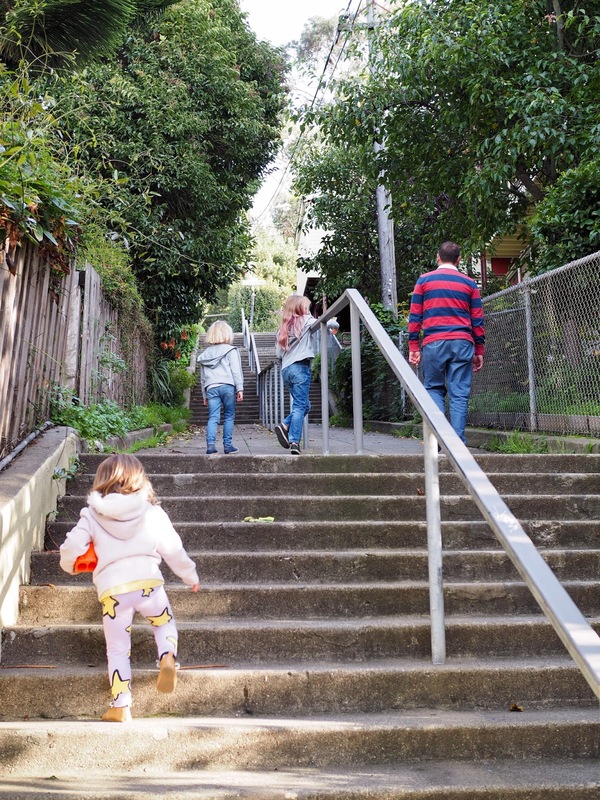 We followed Folsom Street until we were back among homes and made our way to nearby Precita Park Cafe for an early dinner before heading back to Bart. 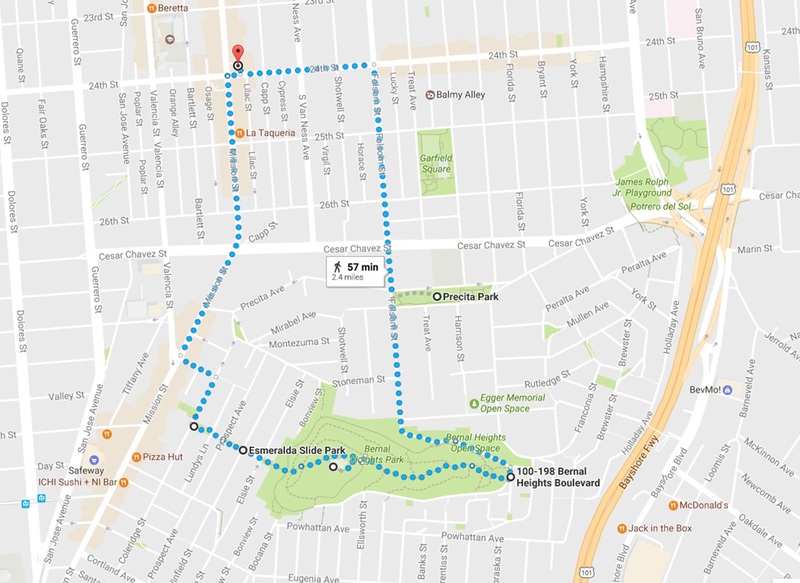 You can see the route that we took to walk to and from Bernal Heights park below or click here to see it on Google Maps. 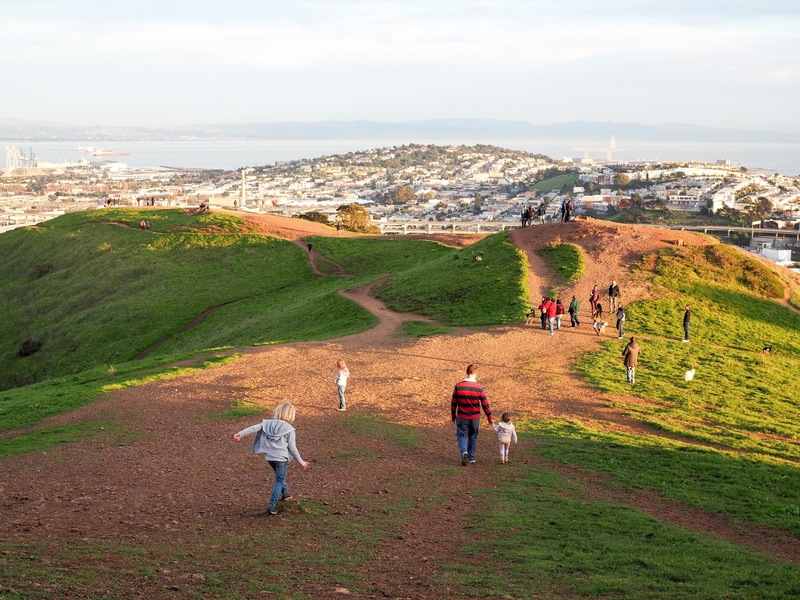 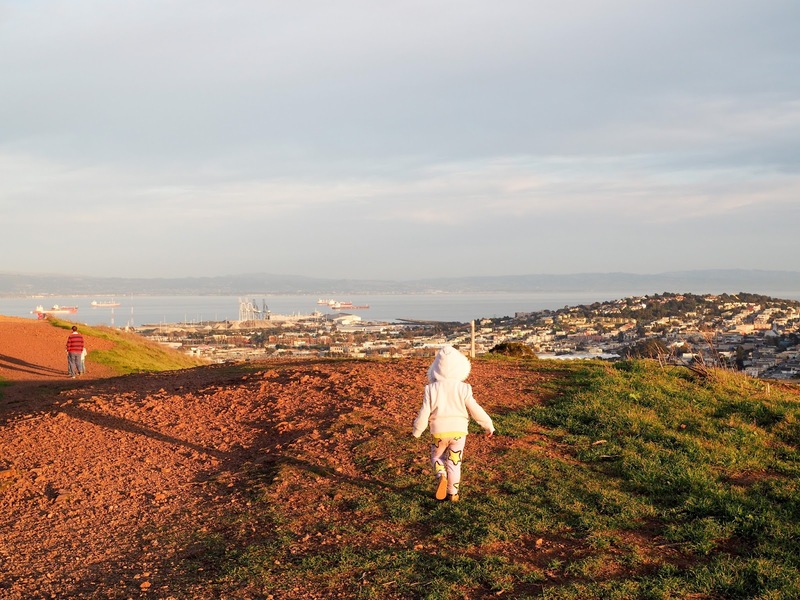 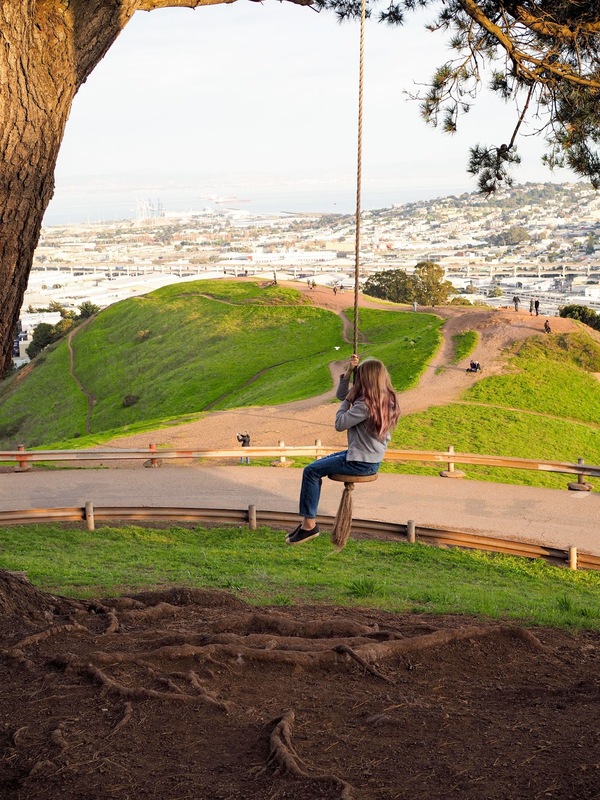 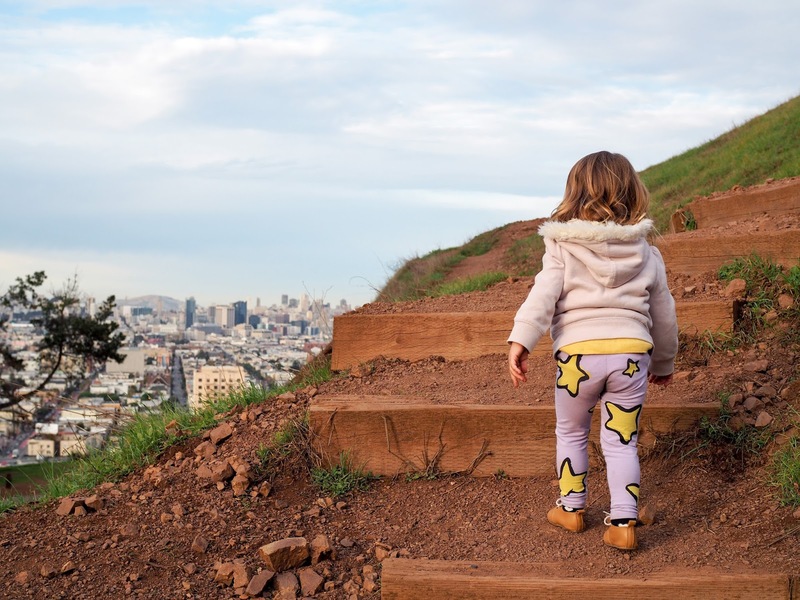 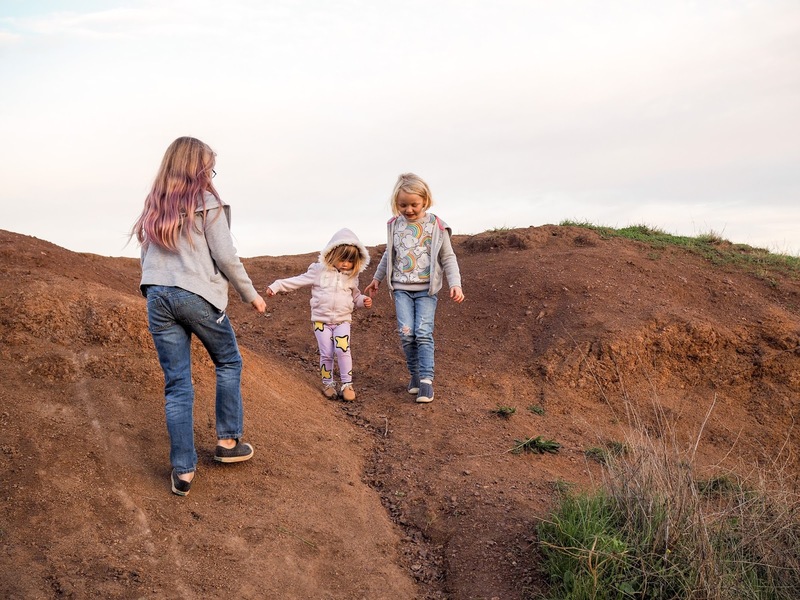 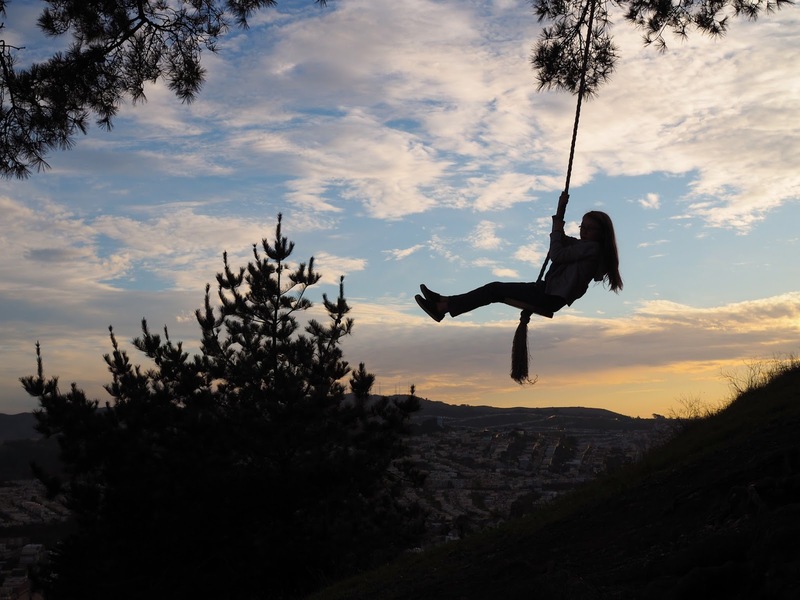 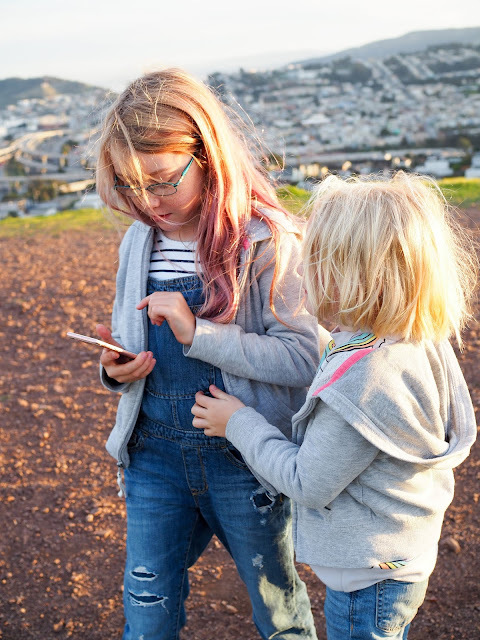 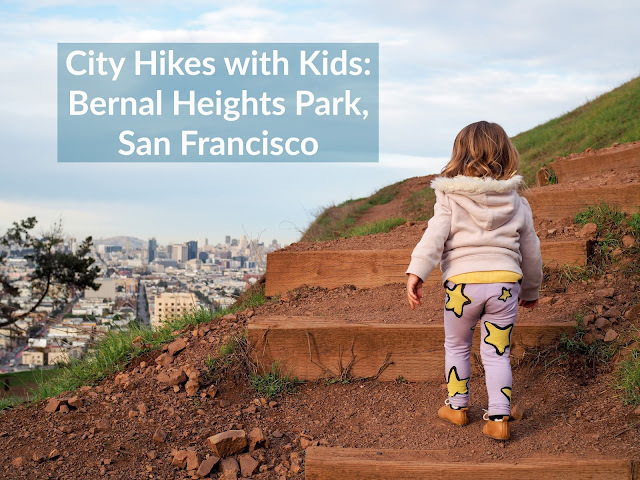 Bernal Heights Park is a great place to take kids hiking. While it's a pretty easy hike, it's not wheelchair or stroller friendly. Lower parts of the hill may be suitable for wheelchairs and strollers though. 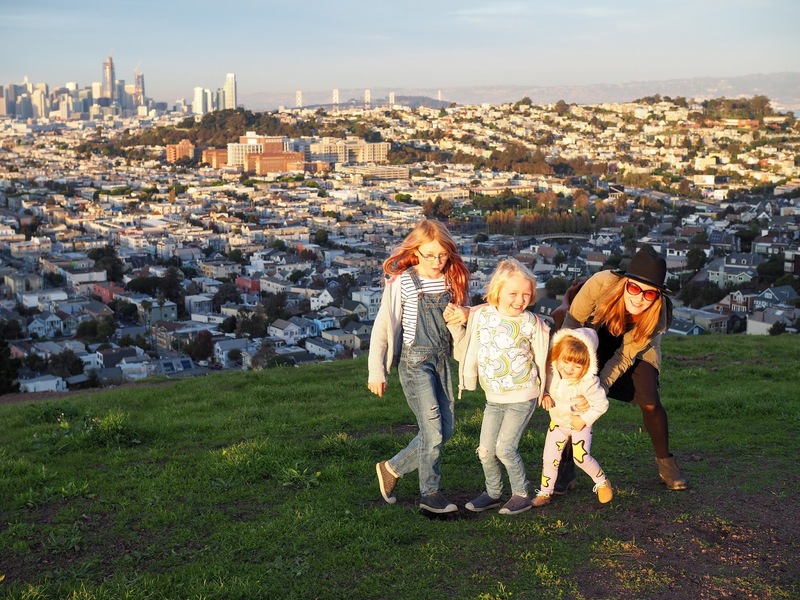 The views from Bernal Heights Park are absolutely stunning, so we'll definitely be adding this location to our "must do" list for visitors. 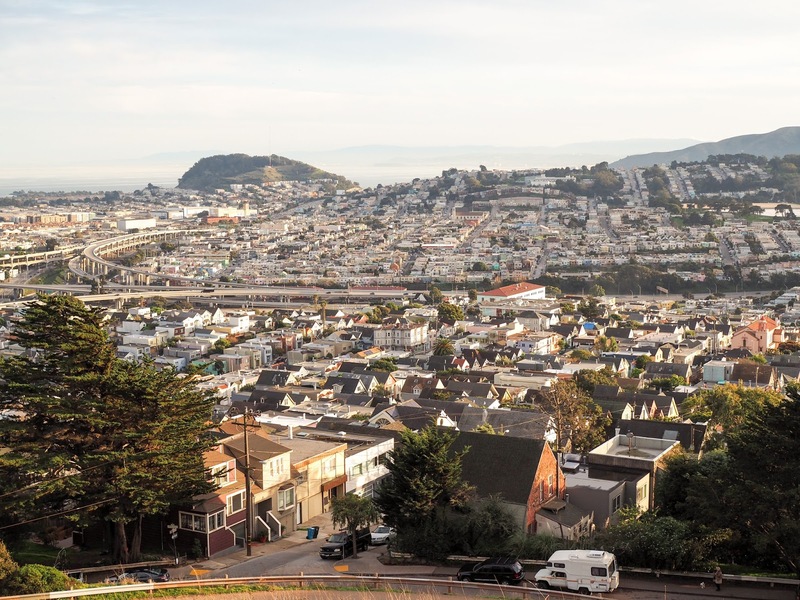 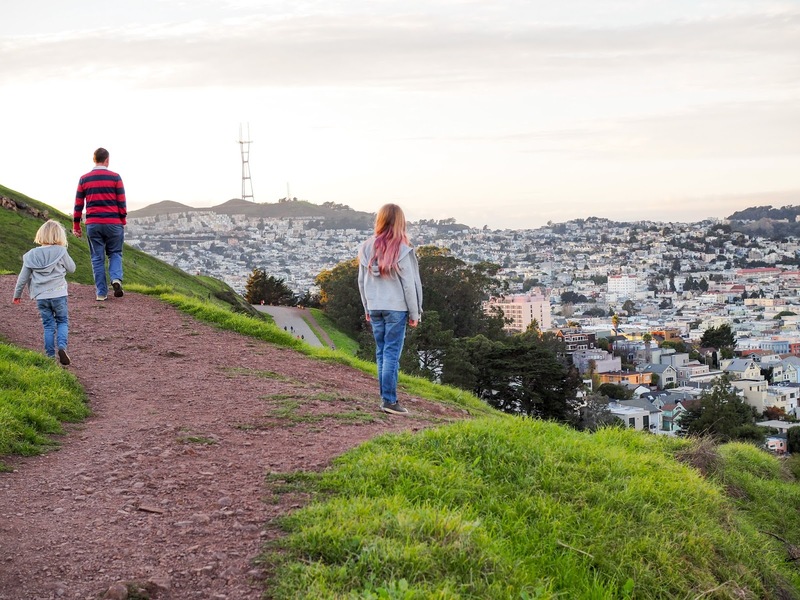 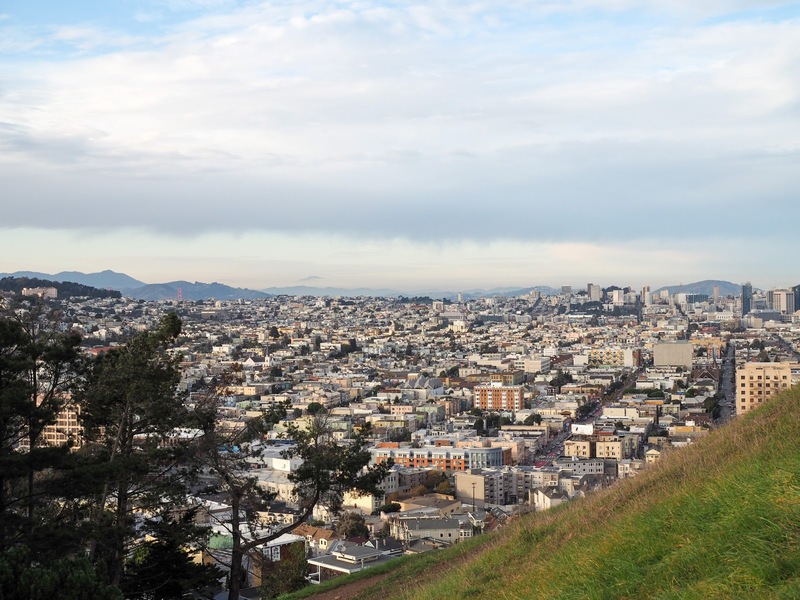 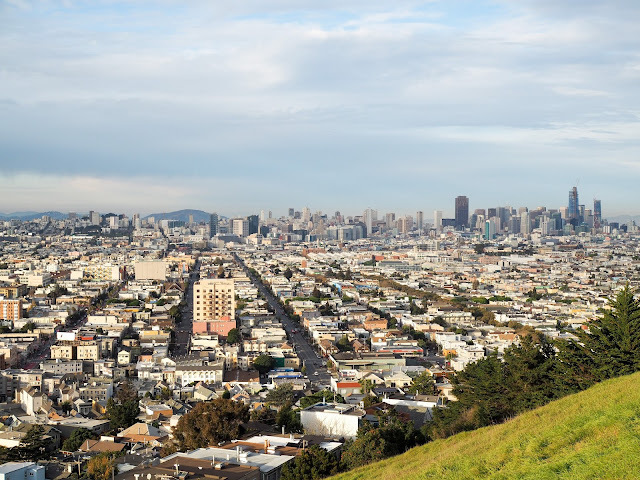 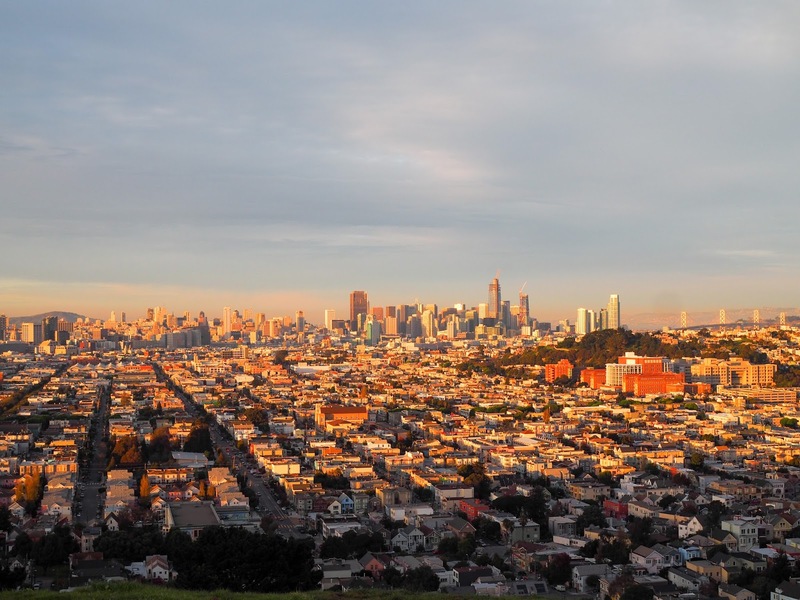 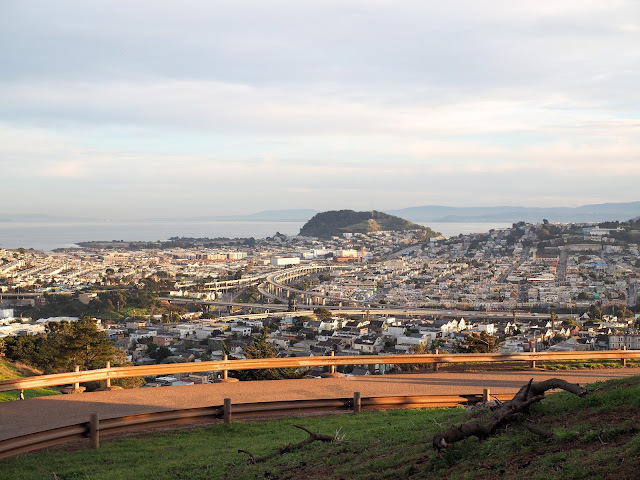 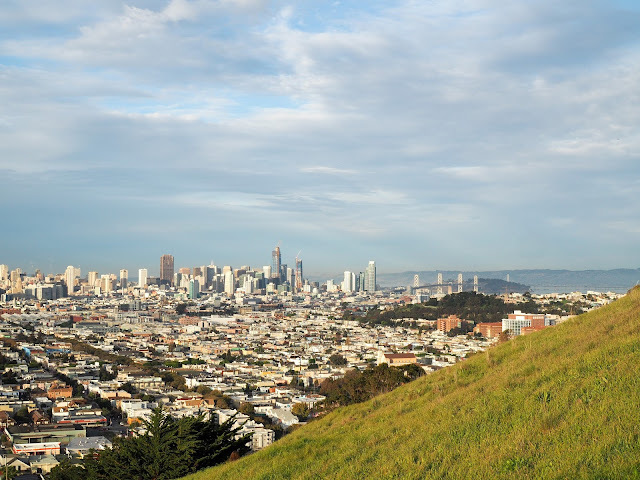 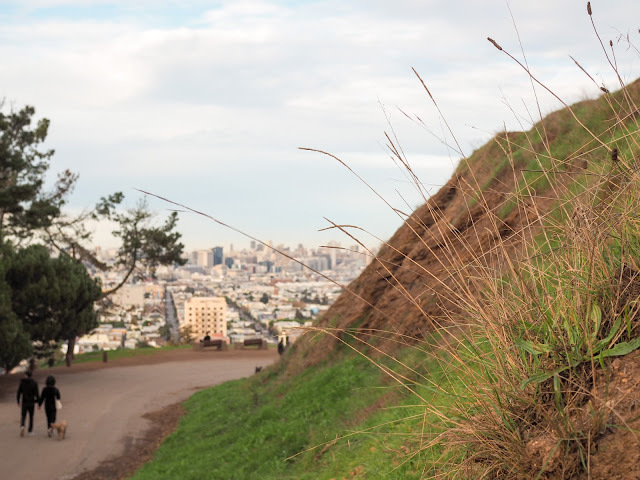 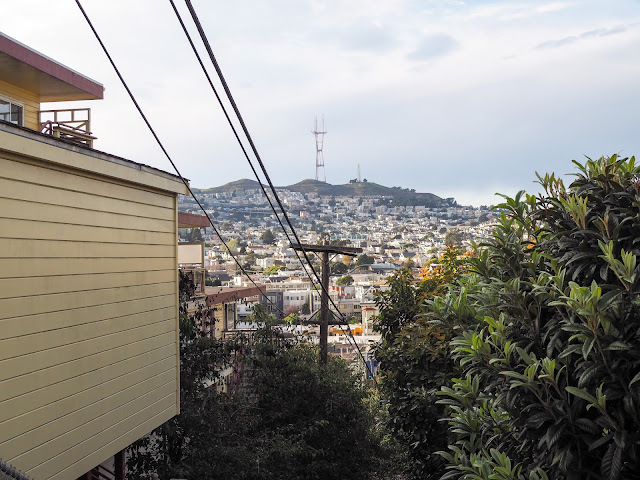 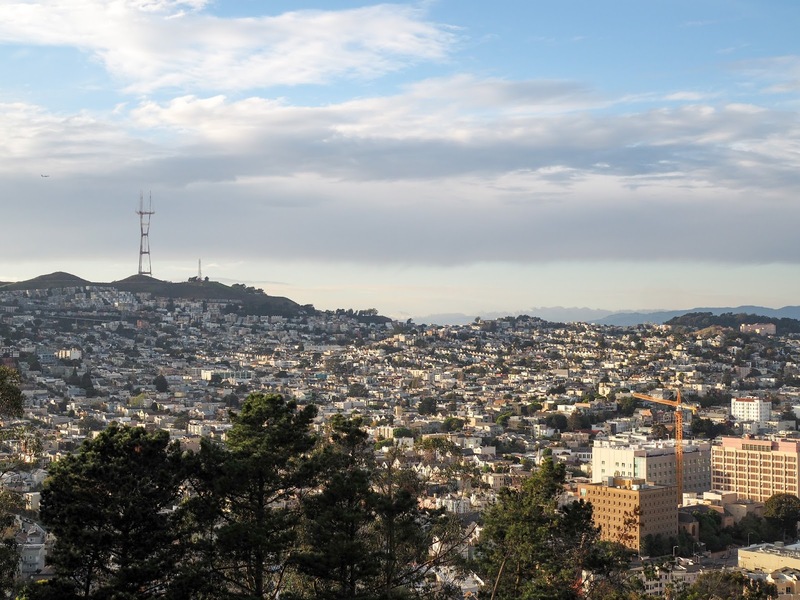 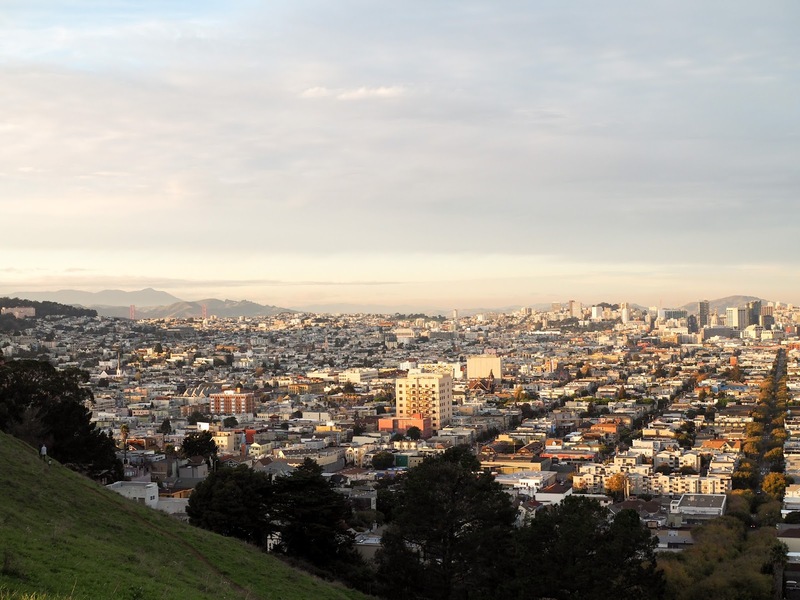 Have you hiked Bernal Heights Park before? If you're in the Bay Area, I'd definitely recommend it!